We rely on the generous support of donors, parishioners and foundations to assist us in funding specific programs including: tuition assistance, the students’ Breakfast & Lunch Program, as well as updating textbooks and classroom resources. Come be part of the Seton community through volunteer work. Your time can be well spent mentoring Seton students. We need volunteers to tutor students, teach Art In Action classes, help students in our after school Homework Club, coach our athletic teams, and participate in Extended Day activities. Seton students benefit greatly from studying with high school tutors who come from local schools to work with them. Several local private and public high schools select this site for their community service experience. Seton School relies on the generosity of people and organizations in the local community to help bridge the financial gap that exists between what a low-income family can pay in tuition and what it actually costs to educate a child. By partnering with those who understand and embrace the mission of St. Elizabeth Seton School, a difference can be made and lives of children impacted. Thank you for considering St. Elizabeth Seton School. Every gift, of every size, is appreciated. Fundraising Events Attend our events. 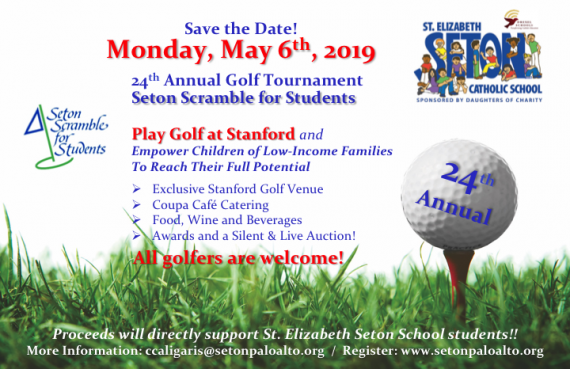 Participate in our annual golf tournament and fundraising events with other community members who are dedicated to helping our underserved students realize their educational potential. St. Elizabeth Seton School relies on private donations and grants to support our mission of transforming the lives of children from low-income families by providing an elementary education regardless of a family’s ability to pay tuition. Meeting the needs of Seton students would be very difficult without donor support. We invite you to join in St. Elizabeth Seton School’s mission, so that together we may ensure that families who are experiencing financial hardship will rest assured knowing their children’s education will not be affected. Your help, regardless of the amount, will make a difference and will touch almost every student at Seton School. School tuition is beyond the reach of most families and virtually all students require scholarship assistance. We rely on the generosity of donors — individuals, community organizations, foundations, and businesses — to help bridge the gap in the cost of educating a child, our tuition and the amount a family can pay. Through the support of scholarships, you will be helping to educate a future first generation college graduate, or pave the way for an English language learner to master critical verbal and reading skills to be well positioned and competitive in the work place. St. Elizabeth Seton School strives to offer quality programs to its students with the goal of inspiring academic exploration to prepare students for a lifetime of learning. The financial commitment of individuals, community and corporate partners enables us to continue offering students a comprehensive educational experience. You may contribute a restricted gift to any of the programs below or donate an unrestricted gift.